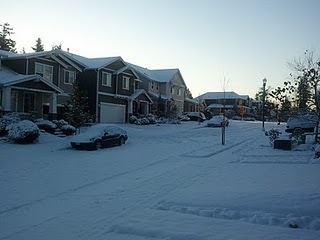 My snowy street at 7am this morning! Remember what that was like as a kid? Ah, man...it still doesn't get any better than that! Well, folks - Seattle was hit yesterday by one monster of a storm! I left work early to try and beat the "second" wave, along with the dubious amounts of traffic that was sure to come with it - and made it home just in time! (And by dubious, I mean the same thing happened two years ago, and it took us 7 hours to get home...a commute that should've only taken 45 minutes at most). 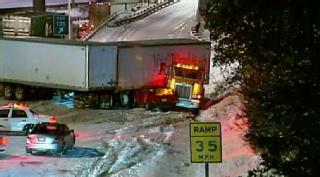 All roads were a complete disaster, as seen in the below photo of a jack-knifed semi on I-5 last night. Crazy jack-knifed semi on the freeway...closing down I-5! 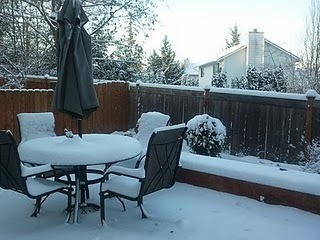 And since I live out towards the Cascade Mountains - we always get a bit more snow than those in the city...and overnight, we racked up an impressive 8" of the fluffy white stuff! Not to mention, it was fa-reezing yesterday / last night! By 6:30pm, it had already dropped to 18 degrees (F) - but with the high winds (gusts up to 60mph), the wind chill brought the temperatures down below 0. Yes, that's correct - I didn't type that wrong...and no, you didn't see it wrong, either! Below 0, peeps. Um, can you say brrrrrrrr without your teeth chattering? My deck - hidden under the 8" of snow! Anyhow - I do have the fine luxury of being able to work from home if needed...so I didn't brave the streets and go in to the office today. Plus, with it being Thanksgiving week and all - it's amazingly quiet...so I'm taking advantage of that and starting the Holidays a bit early! The great news? I'm tackling the last 14,000 words I have to finish up NaNoWriMo and I hope to have that done soon! So I leave you to go write...as I hum "Let It Snow, Let It Snow...Let It Snow!" Newer PostMy NaNoWriMo Challenge...And A Torn Calf Muscle, To Boot!